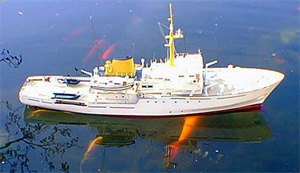 Name ship of the class of four this coastal waters hydro graphic survey ship was constructed by Brook Marine and launched in 1968. Bulldog was built by a yacht builder, she is said to be fitted out more like a luxury yacht than a serving navel craft. Considered by many to be one of the prettiest ships in the Royal Navy, they are seen in coastal waters and at many small harbors on flag showing. On a displacement of 1088 tons and with a speed of 15 knots, these small and powerful survey craft are renowned for there sea keeping abilities, staying at sea in the short and rough coastal waters which is their domain.